nice! any idea on how to get the field label and the field contents displayed in different styles in the tree? 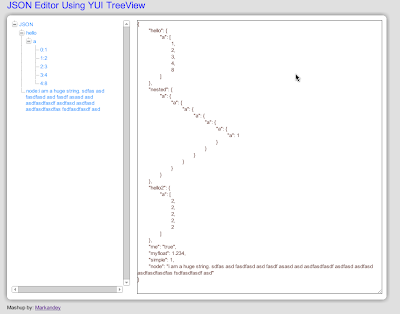 There is function exposed getTree which will return th YUI TreeView Object , You can get everything from that. One point: Just the leaf node is represented as x:y format. Since all property will finally land to a basic Datatype of Number/String/Boolean. All complex object's property is in form of child to its node. Thanks jeff I will fix it..
@jeff Code is fixed , thanks! @jeff I agree ! JSON should ignore function while serializing but i developed this to use in my feed reader ! (http://www.purplegene.com/reader) I have plans to have functions body to remain in JSON as string. You can (& All other readers) can fork ur own copy do make these fixes!